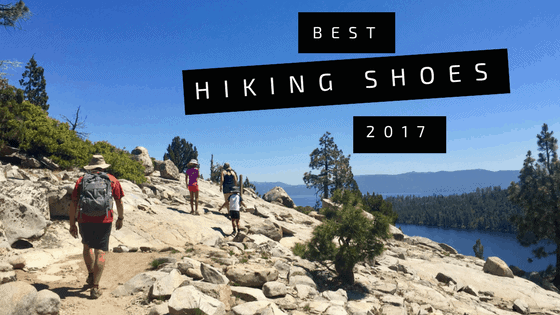 Click here to read our updated blog post with Best Hiking Shoes for 2018! After one of the snowiest winters on record in Tahoe, we are excited to swap out our ski boots for hiking shoes and hit the trail! 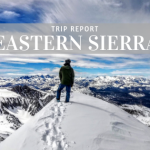 It’s going to be a great season for wildflowers and gorgeous snow capped mountain views here in the Sierra Nevada, one you won’t want to miss. 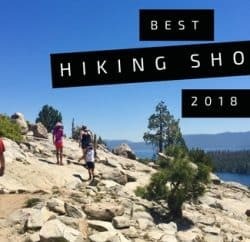 If you’re looking for a new pair of hiking shoes, we’ve compiled a list of our favorites, what we think are the best hiking shoes for men and women. If you live in the Tahoe area, or are just passing through, make sure to stop by our shop, Tahoe Mountain Sports. 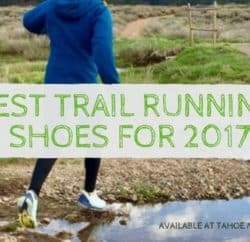 We would love to help guide you into your perfect hiking shoe and share some of our favorite trails. Oboz shoes began as a vision in Bozeman, Montana and the name is inspired by the place. Outside + Bozeman = Oboz. 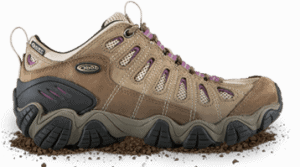 These shoes are the cornerstone of our hiking selection because of fit, feel and performance. Oboz shoes are crafted from carefully selected materials and include a high quality insole. 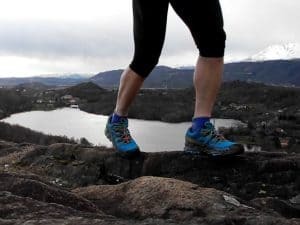 The fit and feel combine to deliver a variety of performance benefits including essential support, zero pressure points, outstanding durability, stability and protection for great hiking shoes that will never let you down! Come try on a pair and see how they compare to your current shoes. 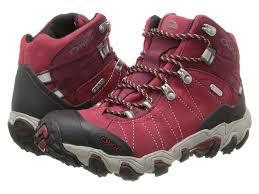 We also carry other brands of hiking shoes and boots so you can find the perfect fit for your foot and activity. 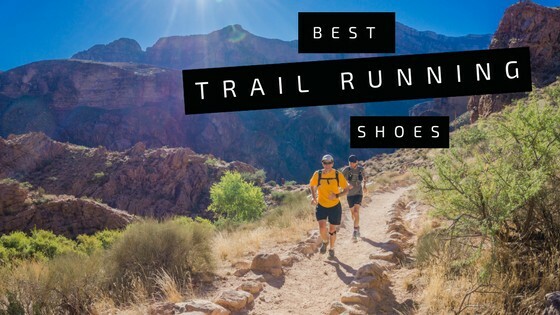 Plus many people are using trail running shoes for hiking because they are lighter weight, high performance and comfortable, click here to read about the Best Trail Running Shoes for 2017. The Sawtooth Low is an Oboz classic and a best seller here at Tahoe Mountain Sports. 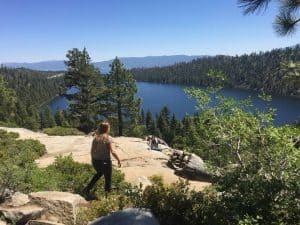 There are so many reasons to love this hiking shoe: it’s lightweight, durable, comfortable right out of the box, and provides excellent support. 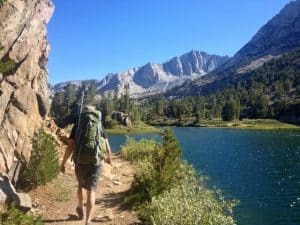 We believe that you could take the Sawtooth Low on any adventure: day hiking in Sequoia, backpacking along the John Muir Trail, summiting Mount Whitney, you choose! 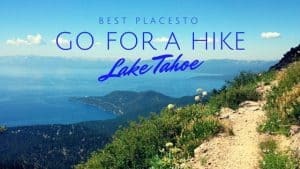 What makes this hiking shoe special? Almost everything, from the inside out. The high quality insoles in each Oboz shoe provide incredible support and stability, plus you won’t have to worry about trimming down aftermarket footbeds. The BFit Deluxe insole in the Sawtooth Low guides your foot into a neutral alignment and provides support across all three arches of the foot. The Sawtooth outsole showcases aggressive tread. It has deep, toothy lugs underfoot that shed shed dirt and mud, and sidewall lugs to help you grip sloping, off camber sections of trail. The outsole is also made of grippy rubber, which makes this shoe rank high in the traction category. With an upper made of a combination of leather and textile, it has found the perfect balance of protection and breathability. Upper – Nubuck leather, high abrasion-resistant textile. 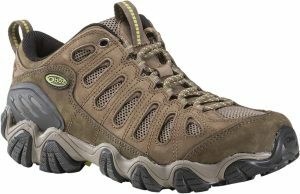 If you’re looking to put in long miles on the trail, fast and light, then this is the hiking shoe for men. Designed with thru hikers in mind, Oboz’s Scapegoat has the technical features you need when going the distance. It’s grippy, durable rubber bottom provides great traction and an EVA plate at the forefoot protects your foot from stone bruising. Oboz footwear is known for their high quality, supportive insoles and the Scapegoat is no exception. The Bfit Deluxe insole in this hiking shoe helps you maintain neutral alignment, wicks away moisture, and adds to the superior fit of this shoe. Comfortable, breathable, and lightweight, this is a great shoe for long, high mileage days. Upper – Mesh with synthetic leather overlays, abrasion resistant rubber coated toe and heel mudguard, elastic scree collar. Ladies, this is the shoe for you! 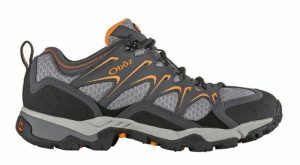 The Oboz Luna is a durable hiking shoe that is fast and light so you can focus on the scenery not your feet . 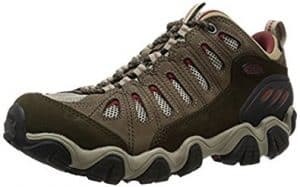 The upper consists of abrasion resistant mesh which allows this shoe to find an optimal balance of breathability and durability shoe and like the other Oboz hiking shoes reviewed in this post, it comes with a high quality insole for all day support and comfort. You won’t have to think twice about traction with these shoes. The four millimeter directional lugs and high traction rubber on the soles will keep you moving over a variety of wet and dry surfaces. The outsole also features a lightweight TPU chassis to protect your feet from stone bruising. Supportive, durable, and comfortable – the Luna is one of our all around favorite hiking shoes for women. The Salomon Odyssey Pro is an innovative, ultra light hiking shoe that blurs the lines between hiking, backpacking, and trail running. 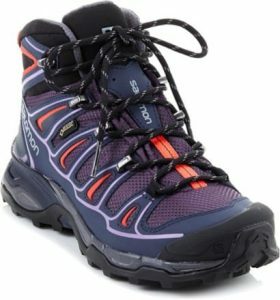 This hiking shoe is incredibly versatile; you can run or hike for miles in it, just make sure to keep your pack light. 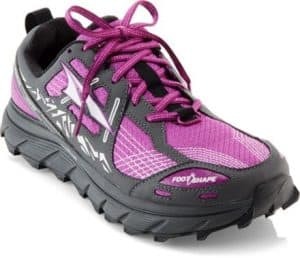 This is a great long distance point to point hiking shoe that provides more protection and support than a trail runner in a minimalist package with wider base and more rigid heel. 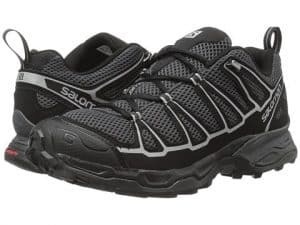 This super light, quick drying shoe incorporates a variety of Salomon’s trail running technologies to keep you comfortable on the trail. The midsole provides extra cushioning in high impact zones and is made out of materials that dampen vibrations to help reduce muscle fatigue and provide lateral support. It also contains Energy Cell+, a high rebound compound which helps you conserve energy with each step. You’ll love the comfortable fit of this seamless shoe, especially as the miles start to add up. The Wildcat is a great crossover shoe that is ideal for going light and fast in the mountains. It can be used as a trail runner, but we also love how it performs as a lightweight hiking shoe, especially over technical rocky terrain. This shoe is designed with added stability, and it’s unique lacing helps secure your foot snugly in a neutral position. 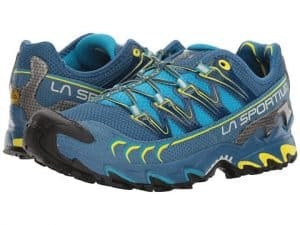 La Sportiva brings a variety of technologies to this shoe to keep you moving quicky and efficiently. Sticky rubber is added to the sole of this shoe for traction and grip (if you’ve ever worn a La Sportiva climbing shoe, you’re familiar with the benefits of their gravity defying sticky rubber). 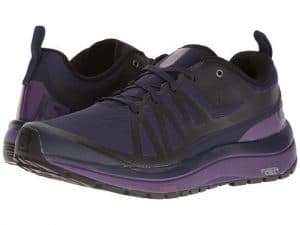 They have also incorporated a system of slanted, opposing lugs in the outsole to increase shock absorption and aid with braking on steep terrain. Designed for the alpine, the Wildcat makes a excellent choice for adventures in the High Sierra. La Sportiva excels at creating performance driven gear for mountain sports and their expertise is incorporated into the Ultra Raptor. 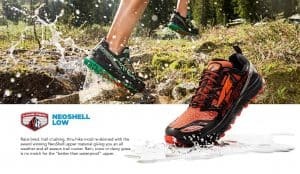 Here you’ll find an all terrain, performance driven shoe that can be used for hiking and mountain running. We love the fit of the Ultra Raptor; it hugs the foot and has extra cushioning under the heel for all day comfort. This shoe is designed for alpine adventures. 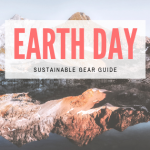 A full length EVA rock guard protects your foot from sharp rocks while slanted, opposing lugs in the outsole work to reduce the impact forces of each step. Their Impact Brake System technology, used not only reduces impact forces by 20% but also helps with braking and traction on steep surfaces. La Sportiva’s renown sticky rubber is used in the outsole and toe cap for optimal grip on technical terrain. of Utah and designed to tackle the gnarly terrain of the Wasatch 100. 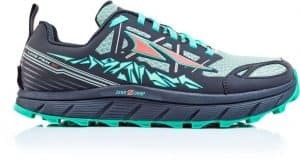 It features Altra’s fully cushioned zero drop platform so you can maintain a natural foot position throughout your run and it encourages a low-impact landing. The toe box has FootShape which allows toes to relax and spread out naturally reducing over-pronation, enhancing stability and creating a powerful toe-off to maximize your running performance. 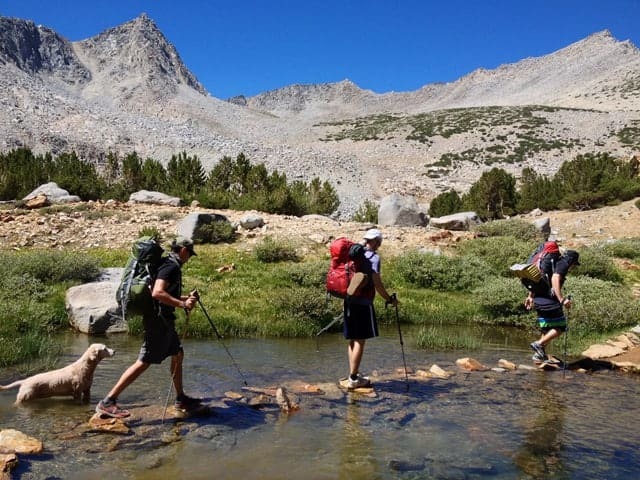 These shoes are a top pick for long distance hikers like Pacific Crest Trail (PCT) Hikers. The Lone Peak 3.5 was just released and is better than ever! 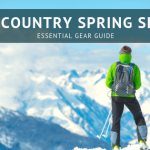 The new version has drainage holes to keep your foot dry, a 4-point gaiter system to keep dirt and rocks out and an updated mesh upper for enhanced durability. The X Ultra 2 GTX is a waterproof hiking shoe that offers four season protection from the elements. 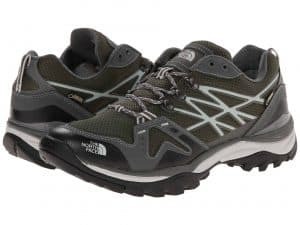 This sturdy hiker will quickly become your go-to for year round adventures – hiking in Yosemite, backpacking in Big Sur, snowshoeing around Castle Peak… A protective upper and breathable waterproof GORE-TEX membrane work together to keep your feet dry and manage moisture within. Deep chevron lugs and Salomon’s High Traction Contragrip outsole give you excellent traction on rock, ice, mud, etc. One of the best features of this shoe is the easy Quicklace system. You don’t have to worry about about your shoe laces coming untied or flapping around, just pull the Quicklace tight and tuck the ends into the convenient lace pocket at the top of the tongue. If you love the X Ultra 2 GTX but are looking for a bit more support, you’re in luck, it comes in a mid-height as well. Upper – PU-coated leather, water resistant textile, quicklace, rubber toe cap. Oboz Sawtooth hiking shoes are known for amazing traction, stability and a cushioned midsole, plus they are comfortable right out of the box! The Sawtooth B-DRY is a fully waterproof system made with a proprietary tape-sealed polyurethane bootie and hydrophobic upper materials to keep your feet dry while a special textile lining wicks sweat away and allows your feet to breathe. These shoes include the O-Fit Insole Oboz is known for which has a low density EVA pod that provides cushioning and comfort. The fit on these is the same as the non-waterproof version with medium volume and standard width, these should fit true to size. 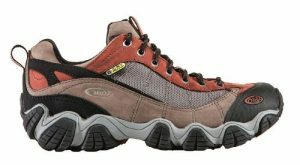 These are a great all season shoe that can are great for everything from long distance hiking to everyday use. They provide the perfect mix of comfort, support and protection. Upper – Waterproof nubuck leather and highly abrasion-resistant textile, Oboz BDry waterproof/breathable membrane, molded rubber toe cap. The North Face Hedgehog Fastpack GTX is a light, versatile hiking shoe that is streamlined to remove extra bulk. With this shoe, you can cover distances light and fast without sacrificing support and protection. The North Face uses CRADLE Guide midsoles in this lightweight hiker to provide your necessary cushioning, protection, and stability. This technology helps properly position your heel and fluidly guide your foot through each step. The Vibram outsole on this shoe gives you great traction on wet or dry surfaces, perfect for rocky scrambles at Donner Pass! You don’t have to worry about wet feet in this shoe, thanks to the waterproof, breathable GORE-TEX membrane. If you’re looking for a no frills, lightweight waterproof hiking shoe, the Hedgehog Fastpack GTX should top your list. Upper – PU-coated leather, abrasion resistant, breathable textile mesh, rustproof hardware. The Lone Peak 3.0 with Polartec NeoShell is perfect for locations with unpredictable weather and mixed terrain. Polartec NeoShell creates a “better than waterproof” barrier to keep your feet warm and dry if you are going through mud, puddles, streams or traveling in wet conditions. It is more breathable than other waterproof membranes so it provides exceptional protection and comfort in wet conditions. They have a StoneGuard flexible rock plate that provides protection from rocks and other trail debris and a smooth, stable ride. The MaxTrac outsole provides a perfect combination of grip, traction and durability that will eat up gnarly terrain like a boss. TrailClaw canted lugs are positioned strategically beneath the metatarsals to provide traction at toe off. 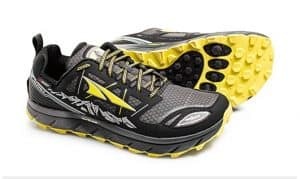 The Lone Peak NeoShell includes other standard features found in all Altra shoes including the FootShape toe box that allows the toes to relax and spread out naturally with the big toe in a straight position. This position for the foot reduces over-pronation, enhances stability and creates a powerful toe-off. 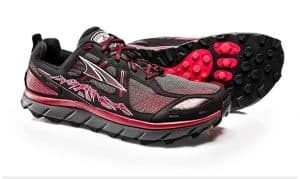 Altra shoes are Zero Drop which means the platform for your foot places the heel and forefoot the same distance from the ground. This allows you to maintain a natural foot position throughout your run and naturally aligns your feet, back and body position for low impact landing. When switching over to a zero drop shoe like this one we always recommend easing into it and building miles slowly. Come into our store for more information on how to fit your shoes for optimal performance. 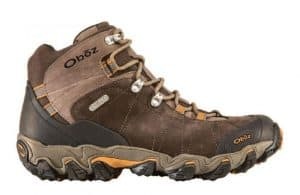 The Oboz Bridger Mid is an excellent choice for hikers and backpackers who want more ankle support in a trail ready shoe. This boot has a high volume in the toe and forefoot with a narrow heel to prevent slippage and blistering. Other features include a protective toe cap, 100 percent waterproof durable finish and O-Fit Insole. The Oboz Insole has three different densities of EVA for cushioning and underfoot support to align your foot in a neutral position. This supportive fit and cushioning means you won’t feel rocks and roots on your next backpacking trip or fatigue as quickly. The deep gripping lugs on the outsole are lightweight and aggressive while providing excellent traction on variable terrain. If you want a traditional looking leather hiking boot with modern, lightweight features this is the one for you. The X Ultra Mid 2 GTX is ideal for fast hiking and backpacking over mixed terrain in variable weather conditions. A GoreTex membrane booties provides breathable, fully waterproof protection from outside elements. The Advanced Chassis and mid-height design create stability and support on rugged terrain. The sleek design and lightweight materials make this a very attractive boot. The Sensifit cradle goes from the midsole to the lacing system to provide a secure and customized fit for your foot. High traction Contragrip outsole provides excellent grip and traction in all conditions. Other features include: Plush tongue and collar, heel pull, breathable fabric lining for a great in-shoe feel and removable molded foam insole. 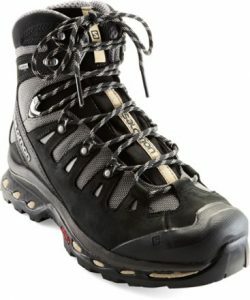 The Salomon X-Ultra Mid is part of our core assortment of hiking and backpacking boots. If you are looking for a study backpacking boot that will provide the support and protection you need when you head out on the trail with a heavy pack, look no further than the Quest 4D GTX. 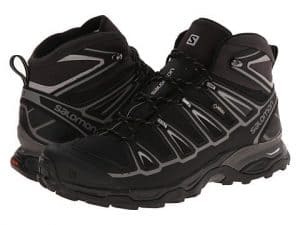 Salomon brought their experience with trail running shoes to the table when they designed this boot and the result is a comfortable, stable backpacking boot that offers exceptional protection from the elements without weighing you down. The high-top cuff and gusseted tongue keep mud, dirt, and debris at bay while a seam sealed waterproof/breathable GoreTex bootie keeps your feet dry. With an outsole made of Salomon’s high traction Contragrip rubber, you can trust your feet on varied terrain. The upper is a combination of Nubuck leather and nylon mesh, allowing the boot to be flexible and breathable. With the Quest 4D GTX, you’ll get year round protection, support, and comfort. 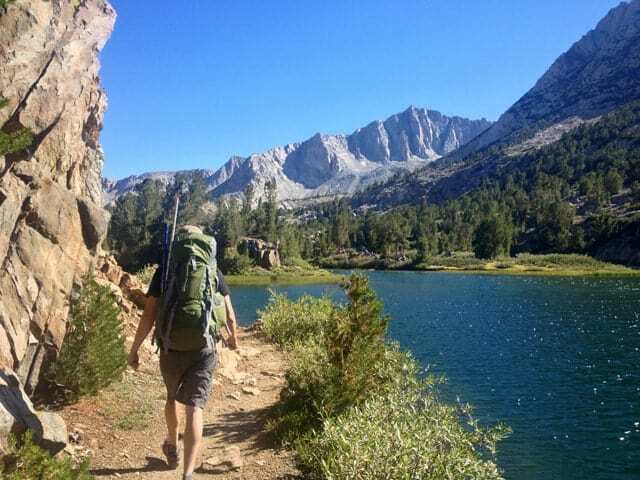 Get your pack ready, this backpacking boot is built for the long haul.